Lt. Gen. Richard P. Mills, the commander of Marine Forces Reserve and Marine Forces North, gives his remarks to Marines and guests during the MARFORRES assumption of command and appointment ceremony aboard Marine Corps Support Facility New Orleans, Aug. 28, 2013. 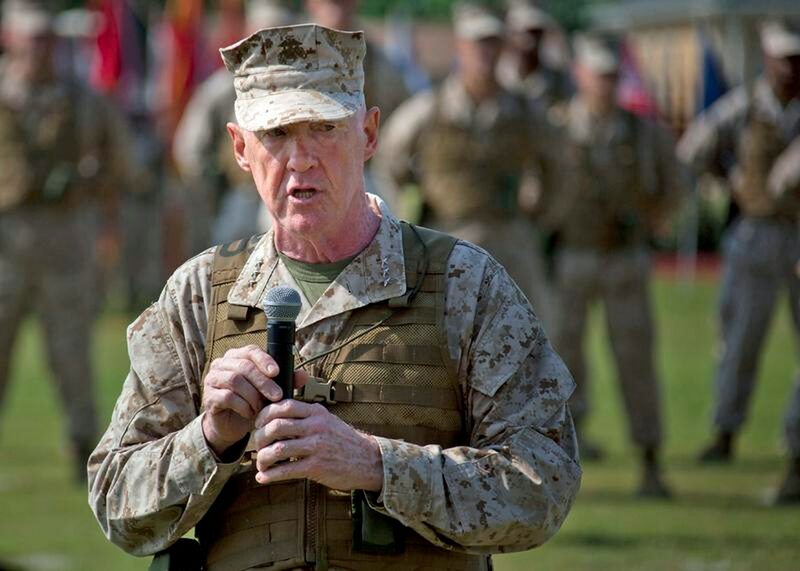 Mills is taking charge of the largest command in the Marine Corps, encompassing more than 100,000 Marines at more than 160 sites in 47 U.S. states, Guam and Puerto Rico. The Pentagon's investigative agency has cleared the commanding general of Marine Forces Reserve of whistleblower reprisal against a Marine civil affairs officer who reached out to a member of Congress for help. In a new report, the Defense Department Inspector General's office found that while Lt. Gen. Richard Mills did take adverse administrative action against Maj. Jason Brezler — touted in media reports last year as a hero for warning about a war-zone threat — Mills' actions were not motivated by retaliation. The 11-page report, released Nov. 4, concerns the aftermath of a 2012 email Brezler sent from his personal Yahoo account to warn fellow Marine officers in Afghanistan about Sarwar Jan, a notoriously corrupt Afghan police chief who was forced out of power by Marines but had recently resurfaced at Forward Operating Base Delhi, a Marine outpost in the Garmser district of Helmand province. The email, which contained a classified document, triggered a flurry of investigative actions against Brezler and ultimately resulted in a 2013 administrative hearing in which a panel of officers recommended his discharge from the Marine Corps. His supporters, including Rep. Peter King, R-N.Y., whom Brezler approached for assistance with his situation, say he had taken urgent action that was justified to counter a perceived threat to Marines. About two weeks after Brezler sent his email, an Afghan youth who reportedly worked for Sarwar Jan as an unpaid servant opened fire on Marines at FOB Delhi with an AK-47, killing three and wounding two. The IG report noted that Mills did send Brezler to a board of inquiry, but found that the three-star had no specific motive to take unfavorable action toward Brezler. The report also said Mills did not know thatBrezler had filed complaints with the DoD IG and his own chain of command about the actions being taken against him. However, the report contradicts Mills' assertions to investigators that he was unaware of Brezler's communications with King. The IG said that an August 2013 Marine Corps Times article reporting King's interest in the case was discussed the day prior to its publication at a general officers' meeting at Marine Corps Base Quantico, Virginia, and that then-commandant Gen. James Amos emailed Mills and other general officers a copy of the story after it was published, in a message reviewed by the IG. "Although [Mills] denied that he read the article, we find it more likely than not he would have reviewed an article the commandant of the Marine Corps sent to him," the IG report stated. Ultimately, however, the IG determined that Mills would have sent Brezler to a board of inquiry regardless of Brezler's IG complaints and communications with King. Mills made the decision two days after arriving at his new command and after reviewing a Naval Criminal Investigative Service inquiry, which found Brezler had 105 documents marked classified on a personal hard drive, in violation of military classification regulations. In testimony cited by the IG, Mills said he could see no reason for Brezler to have those documents, since classification rules were widely known. The report closed the investigation into Mills' actions with no recommendations for further action. Mills and MARFORRES declined to comment on the report. But Brezler's attorney, Kevin Carroll, who represents him pro bono for the firm Quinn Emanuel, said he plans to appeal Brezler's discharge recommendation. He said his appeal will be based in part on his belief that the IG probe failed to fully investigate whether Mills could have been influenced by the senior Marine leaders who had taken an interest in the case.